Where to begin? Grab a chair at a sidewalk table. Order a glass of Chateauneuf Du Pape “Chante Cigale,” a sublime white wine, and before the pour you notice the fine glassware that has been set down at your table. And then at first sip, the wine arrives on your palate at the just the right temperature. Walk inside past the cheese counter and the racks of bottles, and you drift back into a cozy room of wooden tables and chairs. A retrograde décor. Pre-great-war. Fine cheese and bread plates accompany a great selection of wines by the glass or bottle. The wine menu takes in all of the major wine regions in France, but take notice of the Domaine de la Crillone, a hard-to-find can’t-wait-to-taste AOC Ventoux wine. The Domaine covers only 4 hectares and produces an intense Grenache-dominant red. 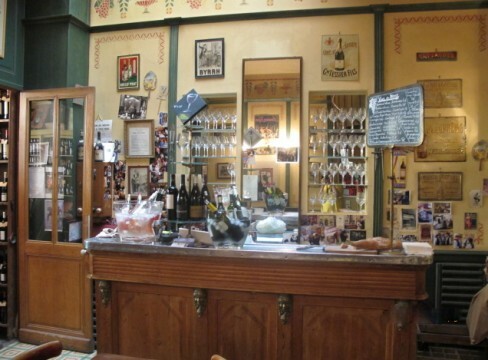 Stéphane et Janique Fina run this jewel of a wine bar in the center of L’Isle Sur-La-Sorgue. Open everyday in July and August; 9:00 a.m. -12:34 p.m. 3:32 p.m. – 7:59 p.m. 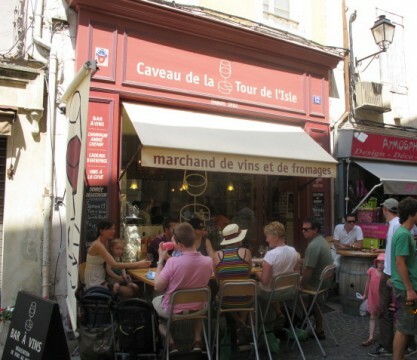 This entry was posted in Wine and tagged L'Isle Sur-la-Sorgue, Wine, wine bar. Bookmark the permalink.